This is the most recent information about Milli Vanilli that has been submitted to amIright. 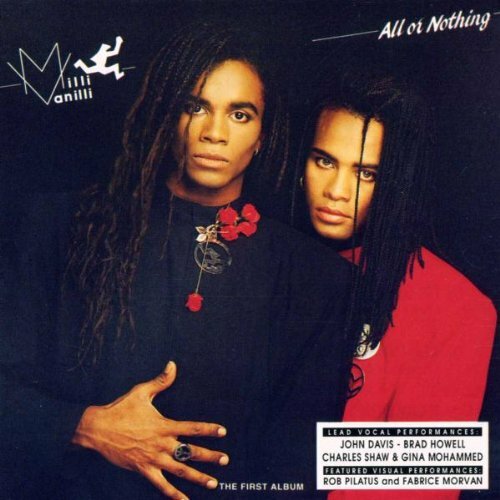 If we have more information about Milli Vanilli, then we provide a link to the section where it appears (the actual page whenever possible). "Baby Don't Forget My Umber" originally "Baby Don't Forget My Number"
I need it to continue with this painting. "Baby Don't Forge My Number" originally "Baby Don't Forget My Number"
"Blame It On The Grain" originally "Blame It On The Rain"
"Blame It On The Drain" originally "Blame It On The Rain"
"Blame It On The Train" originally "Blame It On The Rain"
"Blame It On The Brain" originally "Blame It On The Rain"
"Blame Is On The Rain" originally "Blame It On The Rain"
"Blame It On The Ruin" originally "Blame It On The Rain"
"Blame It On The Rail" originally "Blame It On The Rain"
"Blame It On The Raid" originally "Blame It On The Rain"
"Blame It On The Pain" originally "Blame It On The Rain"
Milli Vanilli Who'll Stop Blaming It On The Rain? "Blame It On The Rain"
It was cold and falling. "Girl You Know It's True"
Yu mean Allah to me. I'm a lover too, girl. I'm in love with you, girl. You can blame it on Lorraine, yeah yeah. You can blame it on the rain, yeah yeah. ooh ooh ooh I love you. It's repetiitive even though Fabrice and Rob weren't the ones who were singing this song. What else is really amazing is that they were able to get away with it for so long. It took a year before they were stripped of their Grammy. Ed Note: The "girl you know it" part is what skipped during the performance that ultimately ruined Milli Vanilli forever. "Sending All My Love "
The above phrase represents about 90% of this song. Even though this is an very good song, it could have have been even better with a break in the repeating lyrics. It still is the same in you. 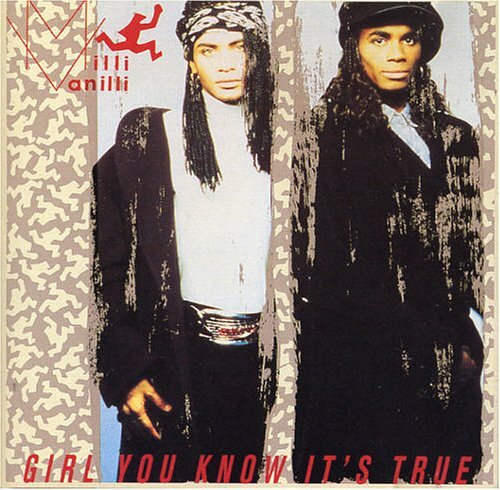 "Baby Don't Forget My Number"
"Lipsyncing to someone else's vocals"
Milli Vanilli did not sing a single note on their album Girl You Know It's True. In concert they would just lipsync to the recording and sometimes the recording got stuck, thus revealing them as frauds. As a result, they had their grammy for best new artist revoked.